I checked out the classic animated Star Trek on Netflix and was pleasantly surprised. Sure the animation is pretty limited, but the stories were great, some would have been perfect for the live action series. The best part is that the entire original cast provided voices, lending the cartoon a real air of authenticity. Before anyone else gets this wrong: Checkov (who wasn't in the Animated Series) was not in the original cast of the show. He was introduced in Season Two. Well, if Walter Koenig's Chekov doesn't qualify him as a member of "the original cast," then what about Grace Lee Whitney's Yeoman Rand? Or Jeffrey Hunter's Captain Pike, for that matter? Anyway, it's another great cover, and I agree with everything you say about the animated series. While Chekov was not in the Animated Star Trek, Walter Koenig wrote one of the episodes. Unfortunately "The Infinite Vulcan" was not one of the better of the 22 episodes. The first episode, otoh, "Yesteryear" had a number of ideas that were later referenced in TNG, DS(, and in the 2009 reboot. I think it's fair to consider "the original cast" to imply "the original cast of main characters after the pilot episode that actually got picked up." 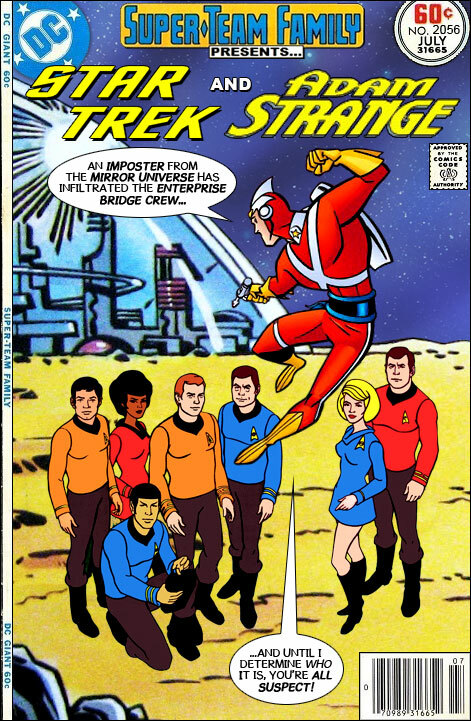 As for today's cover, the impostor is pretty obviously Uhura. Mirror Sulu would be easy to identify with a routine med scan, (He could cover the scar on his cheek but it would still be identified) Mirror Spock would find such hiding illogical when he has a revolution to lead. Mirror Kirk is too savage to hide for long.McCoy simply doesn't have the temperament for it and his Mirror counterpart would have a hard time fitting in. Uhura on the other hand, is in an ideal place to listen in on things that someone in the Mirrorverse might want to know, we could expect her to be as good an actress as her in-universe counterpart (Who certainly fooled the Mirror crew), and in the composition of the cover, she's subconsciously placed herself so everyone else is between Strange and herself, also her Star Fleet insignia is completely missing/obscurred. As part of Trek's 50-year anniversary, BBC America marathon'ed the TOS episodes in order, and uncut (they were about 6 to 8 minutes longer than today's shows). As I watched them all again I was surprised about how hit-and-miss the "bridge crew" and Scotty's appearances were in Season 1. NBC didn't really publicize the show until season 2 (I have a one of the mass-marketing stills of the 'big 7' gathered around the captain's chair) and with the jumbling of the episodes in syndication, it's not surprising that the season 2 cast is considered the "original" crew in most non-fanboy minds, just as Cap is considered one of the original Avengers. Wait.. what? You've only now been introduced to ST:TAS? I kinda envy you. It's the second-best ST ever, being as it's really just an extension of TOS. I had seen a few episodes as a kid but barely remembered them. I always assumed that the reason Mirror-Sulu had that big scar showing was that in the Mirror Universe scars like that were a status symbol. The two universes seem to be substantially identical in technology,and the only way the characters in the usual universe could be as many fights as they were without any of them having big scars showing would be if they had the medical technology to erase them. So if Mirror-Sulu were going to infiltrate the usual universe, he could have erased his scar before he crossed over. I would hope it would be him, for three reasons. First he was the most satisfyingly villainous of the whole Mirror crew. Second, his failed effort to assassinate Kirk and Spock left him exposed to assassination by the operatives of either, so he had no incentive to stick around his own universe. Third, the usual Sulu, not having crossed over to the Mirror Universe, might not be on his guard the way Kirk, Uhura, Scott, or McCoy could be expected to be. I'm probably one of the few Trekkies who regards the Filmation spin-off as canonical. Especially in regard to their introduction of such concepts as the hologram-generating recreation room (aka "holo-deck") and Native American Starfleet officers. So, I tip my metaphorical hat to you, Ross, for including these all-too often underrated versions of the original characters. As to which one might be the mirror-verse infiltrator? I'll guess it's Sulu. He's the only one not looking Adam Strange straight in the eye! @Marc Harkness: Los Thunderlads is right. If Federation medical science could surgically alter human ears so as to fool even Romulans, mirror-verse medical science should certainly be able to make the surgically-removed remnants of a scar completely undetectable. Actually, The Animated Series is now officially canon. How can it be officially canon when new movies contradict them? I prefer to just think we are now watching movies from a parallel universe not that Kirk, McCoy, Sulu, Uhuru and Chekov were close in age enough to go to school together and Spock's intervention cause universe when years they were born changed. *Which is why I unapologetically refer to STAR TREK: INTO DARKNESS as "The Wrath of Ret-Con." "Actually, The Animated Series is now officially canon." Yes, Chuff-Captain! Even the Kzinti (whou could be alias the Zenkethi). Kang Vs. Krang Vs. Kang! Robin and Daredevil in "Duplicating the Dead!" The Lone Ranger Vs. Werewolf by Night!